As there is some interesting new features coming in next release, I wanted to write a blog post rather than just a release note on XrmToolBox portal. I would like to focus on three new features today. It has been a much requested feature since months, so I’m really happy to give you the capability to connect with an account protected with MFA. It was already possible by using Connection String but you can now connect using UI only. When ticking the MFA checkbox, you will be presented with a new connection wizard step that requires you to provide information about an Azure AD Application (AppId and Reply Url). You get it, MFA requires this kind of application. You may need to asked your Office 365 admin to create the application. This step provides a link to explain how to create an Azure AD application for Microsoft Dynamics 365. This is a pretty new feature request but I thought it is really an helpful one, so I implemented it immediatly. 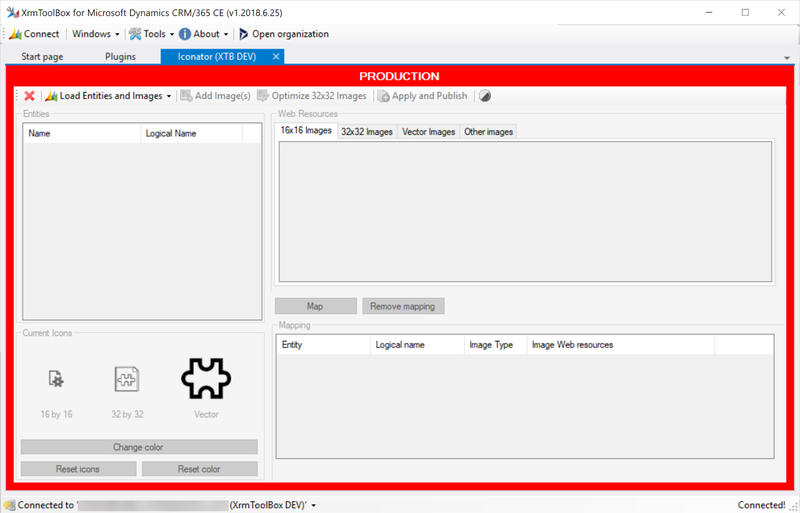 How many times did you alter production organization from XrmToolBox, whereas you thought you were altering dev organization, just because it is not so easy to differentiate which plugin is connected to what organization? So, the point of this feature is to allow you to define some settings to highlight a plugin when connected to a specific organization. During the last step of the connection wizard, you will now see a new button to define highlight settings. By clicking this button, you will be prompted to choose one of both predefined template (Production or UAT) or to choose your own settings. 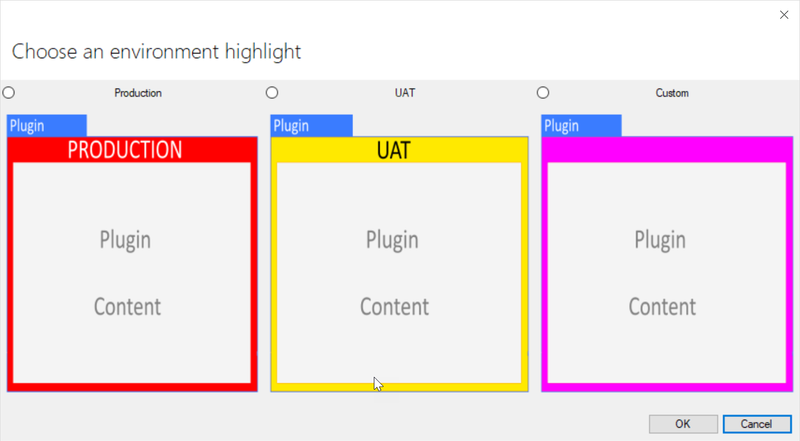 This dialog shows you a preview of how the plugin will be highlighted. 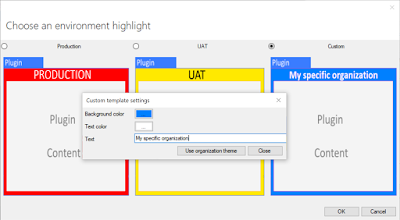 If you click on Custom radio button, then an additional dialog appears to let you choose colors you want, and even retrieve color from the organization theme (CRM 8.1 and above only). 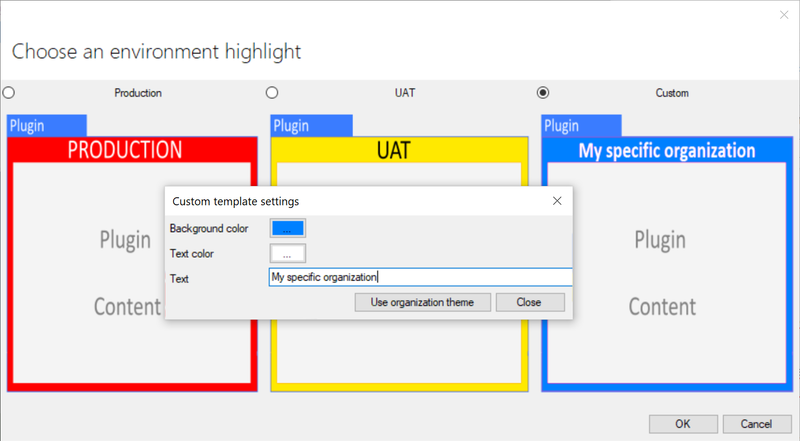 Each time you change a setting, the custom template is refreshed to show you the result in real time. These highlighting settings are stored in you connection information. 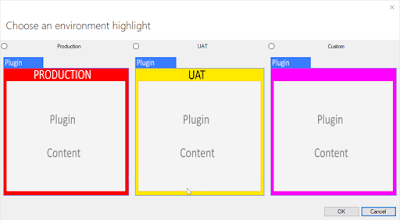 So each time you open a plugin with this connection, or when you update a plugn connection, the highlighting is displayed. As you can see, there is now way you don’t figure out you are acting on a plugin connected to the production organization! It may happens you need to open the same plugin on different organizations, to compare configuration or metadata, for example. XrmToolBox now allows to select multiple connections when opening a plugin. This will open the same plugin as many time you selected connections. I hope you will find these new feature helpful! Some other minor improvements are planned. You will have the whole list when release notes are out. With version 9 of Dynamics 365 Customer Engagement, Microsoft added a new type of image web resource : SVG files. They are vectorial images that can be used in any size. These images are used for Unified Client Interface, the new web interface also introduced in this version. This icon must be a vectorial image with transparent background and black forecolor. D365 will adapt the color to render the icon properly. You can find icon for your entities on www.flaticon.com, some icons are free, even in SVG format. Dynamics portals are a great solution to create portals and expose Dynamics 365 data to people not using our beloved XRM application. One of our customers asked us to have a login control directly on the home page instead of having to click on “Sign In” link, then show the login page, then log… I think you got it. The problem is the login page is a hidden page that cannot be customized. So, I found a (dirty) way to handle this request. In my home page template, I added two input controls and two buttons (Sign In and Lost password), like below, nothing fancy. What does the script? when clicking on the login button, copy login and password from your custom login control, then paste them in the login iframe, then click on the login button in the iframe. Set a timer to check periodically if the login succeeded. How to detect that? if the Username textbox is not in the iframe anymore, then the login succeeded. So, refresh your homepage: Voila! you are connected. If the Username textbox is still there and there is a validation summary on the page, login failed. Read the error message and display it on your home page. This plugin come from the need to export/import portal records that have been created/updated since a specific date. I implemented a portal for one of my customer last year and he updated pages content and some other portal records. This portal needs new features so we added new portal records in our development organization. But it is not an option to deliver again these pages since it would overwrite customer changes. So I needed a way to deliver only specific portal records. So, how to do it easily? I cannot use Configuration Migration from CRM SDK since it would export all records for defined entities, not only the newly created or modified ones. I cannot use standard export because I would need to export multiples entities and even NN relationships and manage import of multiple files. Better! I can now use an XrmToolBox plugin! The plugin allows to select portal entities and to define some options to retrieve records. Then you can be more precise by selecting only records you need. Finally, you can export the records in a file. Today, I was assigned a task to compare form load performance between available browsers for Windows (ie Chrome, FireFox, IE and Edge). This performance center is available in all browsers (at least with CRM 2016+) but the key combination closes Chrome! A colleague of mine recently asked if it was possible to inspect data usage to determine which attributes are useless in a CRM 2016 organization because not filled with any value. My first answer was: no. I used to know a solution named CRM Data Detective that does the same but for CRM 4 and CRM 2011 only. Ok, I was wrong and found out that a version for CRM 2015/2016 also exists. Anyway, the major problem with this solution is the fact that if the entity you want to inspect has more records than the AggregateQueryRecordsLimit (which is 50,000 in CRM Online and cannot be updated), then you don’t get real usage statistics. This plugin resolves this limitation by querying actual records instead of performing aggregation query (only if aggregation query fails because of the limit). This can impact performance but if you really needs it, you get it. You can also export the result in a raw Excel file. As usual, please use the Plugins Store in XrmToolBox to get this plugin. Hi Dynamics CRM community! It’s been a long time since the last article on this blog! Today, I want to share with you what’s new on Iconator plugin for XrmToolBox and where these changes come from. Cannot set entities color. You can do it in customizations but one by one entity. First, I added possibility to optimize 32x32 images. To do so, click on “Optimize 32x32 Images” button. A dialog opens and shows all 32x32 images that don’t have a 2 pixel transparent border. The dialog shows how the optimized images will fit in its 32x32 canva. You can also change the background and icon color (for preview only) to see what it looks like with you own custom theme. Select images to optimize and click on “Update Icons” and Voilà! Second point, being able to change Entity color. Let’s imagine I optimized and apply the above icon to the selected entity. By clicking on “Change color” button, I can select another color for the entity, preview the change and apply it by clicking on “Apply color change” button. Last point, it’s now possible to select multiple entities to update their icons and color in one single operation. 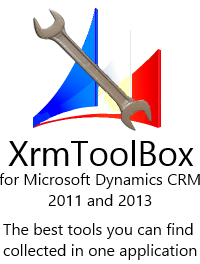 This update will be available soon in the XrmToolBox Plugins Store so keep an eye on it or follow me on Twitter (@TanguyTOUZARD) to be notified when the plugin update is available. CRM 2011 Plugins: Welcome to transactions !